The sounding of the bugle for elections to India’s Upper House in central parliament (Rajya Sabha) proffers a solemn occasion to consider (or rather reconsider) the constitutional waters of Indian bicameralism. Fifty-nine members from seventeen Indian states/provinces shall be elected today to the upper chamber of Indian ‘temple of democracy’ Maneuvering beyond transient concerns of power politics, this article endeavours to extrapolate the larger constitutional and systemic issues plaguing Indian bicameralism. Institutions such as parliaments are not only the most apparent but also important indicators of constitutional identity. The Rajya Sabha’s role in the Indian democratic set-up has been repeatedly called into question, including numerous failed attempts to abolish and do away with it altogether. Since the idea of having a House of the People is most central to any popular democratic setup, any attempts at setting up an unrepresentative and unpopular (in the sense of being indirectly elected, and hence inferior to a body which is directly elected) legislative chambers is necessarily a terrain fraught with obvious dilemmas going to the very roots of democratic philosophy. Such a premise against having indirectly elected chambers substantially raises the threshold of the burden on legal scholarship to develop strong reasoning to firmly ground Rajya Sabha in India’s modern-liberal constitutionalism. I shall analyse and critique the contemporary legal position governing one of the many aspects of constituting Rajya Sabha on the two axis of structuralism and functionalism. The former axis shall seek to underscore how the formation of Rajya Sabha in terms of its membership profile affects its constitutional identity. On the other hand, the latter envisions to a study how the performance of its role and responsibilities affects its character in Indian constitutional scheme. These two approaches can help us to appreciate the settled yet intriguing question of domiciliary requirement as a part of candidacy for Rajya Sabha. The question as to whether candidates coming to Rajya Sabha should have a domicile of the state from which they are contesting elections has been answered by the apex court in the negative. Since apex courts are not final because they are infallible, mere positivistic settlement of questions of law should not be a ground for not re-opening them. 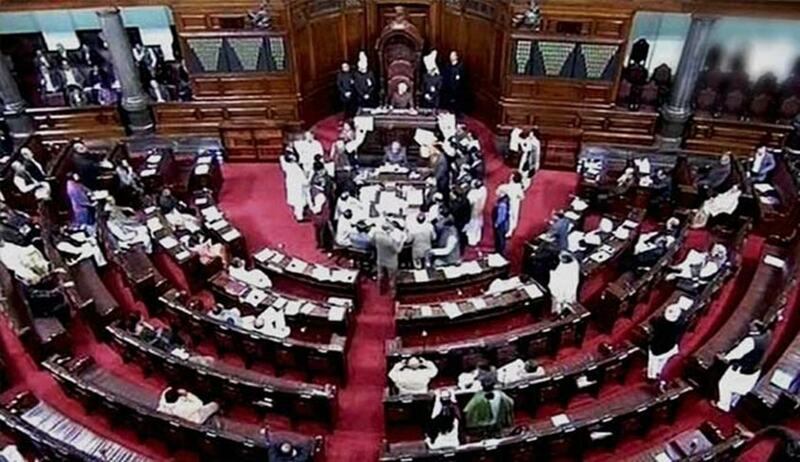 The members to Rajya Sabha are elected by members of state legislative assemblies by a system of proportional representation through the single transferable vote system. Whenever elections to Rajya Sabha crop up, one of the most vexed questions pertains to the residential or domiciliary status of candidates fielded by different political parties. Although legally not a material consideration post-2003, the domiciliary status of the candidate may yet evoke considerable political controversy; and this is problematic. On 7th March, 2018 the Chief Minister of Karnataka appealed that no outsiders should be flown down to contest RS elections from his state. This political stance may be contrary to what most national parties have otherwise maintained against prescribing mandatory domiciliary requirement. The lack of a legally binding domiciliary requirement found favour with the Supreme Court in its judgment in Kuldip Nayar v. Union of India & Ors (AIR 2006 SC 3127) where it held (mostly for technical and pedantic reasons) that the pre-2003 requirement for Rajya Sabha candidates to belong to the state from which they aspired to get elected was not a part of the “basic structure” of Indian constitution. A major reason for this holding was that the domicile requirement appeared only in the Representation of People Act, 1951 and not in the four corners of the constitutional text. I contend that this judgment did violence to the structural sanctity of Rajya Sabha’s identity as being a ‘Council of States.’ However, the Court did not view this matter through the interpretive lens of constitutional identity, which is the pivot on which the stance taken in this article flourishes. This is not a comment on the case per se since the arguments advanced here are distinct, and explore the concept of constitutional identity as expressed partly through constitutional institutions. I contend that the Supreme Court in Kuldip Nayar failed to appreciate the structural imagination of India’s upper house as espousing federal aspirations; it accorded extraordinarily high value to its functional role-play in the constitutional scheme. The cause which I identify for such imbalanced treatment by the Court between second-chamber’s posited structure and envisaged functions are historical antecedents which seem to be entangled in some form of irreconcilable confusion. Reference to constitutional framing in India and other jurisdictions (like the United States) will inform us how the functionalist explanation of a second chamber did not principally and ordinarily focus on federal concerns but was grounded mostly in what are considered good parliamentary praxis targeted at framing sound legislations. James Madison wanted the Senate in the United States to be a “defence to the people against their own temporary errors and delusions” which would bring in elements of tranquillity and deliberation in the state’s legislative activity. Within India’s constituent assembly, the discussions surrounding the second chamber primarily underscored the need for it to be a “review and reflective” chamber which could devote a “sober second thought” to any “mobocracy” effectuated by the lower house. In fact, the conceptualization of Rajya Sabha by the Constituent Assembly as functioning as a federal chamber has been described as a “deeply ambiguous” by Shankar and Rodrigues. India’s colonial past (which saw a second chamber set up under the Government of India Act, 1919) was one where federalism hardly played a reckonable role, may be a factor to blame for this lack of federal vision for independent Indian parliament’s upper chamber. Jawaharlal Nehru believed that the Council of States existed primarily to proffer a sort of ‘cooler atmosphere’ for legislative work. Therefore, the primary functional justification for bicameralism that emerges post our perusal of constitutional history is that second chambers were not perceived to be meant for federal bickering but to act as reviewing and reflective chambers. However, the constitutional text has something more interesting and but different to offer. While the primary explanation for Rajya Sabha’s functional role merely as a revising chamber is scarcely found in the text of the constitution, it is its federal ‘powers’ which are more visibly found in the constitutional text. A clear instance of its ‘power’ to bring the states’ concerns to the central level is found in Article 249 of the Constitution, which empowers the “[Union] parliament to legislate with respect to a matter in the State List in the national interest” provided that the Rajya Sabha declares so by way of passing a resolution. “several persons whose presence could add to the quality of debates and proceedings in the Council of States had, under the dispensation before  amendment, been constrained to enroll themselves as voters in another State just in order that they could be elected from such State. It has been further submitted that unless they did so, some States would remain unrepresented in the Council of Ministers due to the non- availability of such talented members of these States in the House of the People and the Council of States and, thus, the opening out of the residential provision was meant to help in this regard.” (Emphasis supplied). It is submitted that the afore-reproduced qualification that a candidate for membership of Rajya Sabha should possess the qualities of being a good parliamentarian are only moralities of aspiration and cannot be equated with black and white legally implementable criterion such as residence and domicile. The domiciliary requirement, if not a sine qua non in the functionalist conception of second chambers, is nonetheless a strong marker of their structural make-up. Doing away with it does damage to its constitutional identity. The need is to restore Rajya Sabha’s institutional legitimacy by upholding its constitutional identity. This article has shown how the structural and functional axes of Rajya Sabha’s personality need to be harmonized. Therefore, the domiciliary requirement warrants a re-instatement and this time possibly into the constitutional text; a move, which I contend could solidify Rajya Sabha’s place in the Indian democracy’s constitutional scheme. Abhijeet Singh Rawaley is a Bar Council of India Trust Scholar at National Academy of Legal Studies and Research (NALSAR), Hyderabad. He can be reached at abhirawaley@gmail.com.